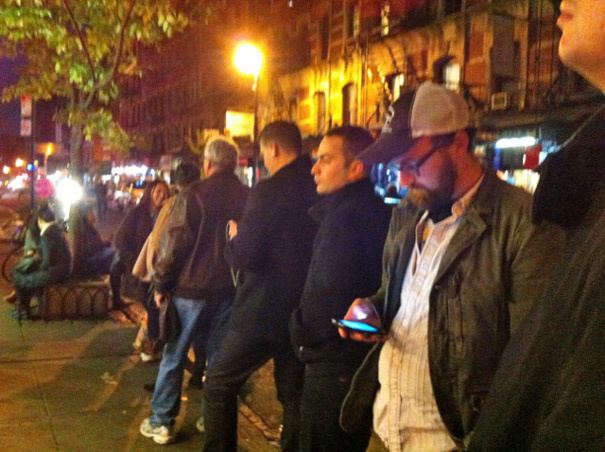 Before I returned to New York this fall, I started a little folder in my browser called NYFood. I read my EaterNY, my Grub Street, and then bookmarked in my special folder any place I felt like I had to visit. 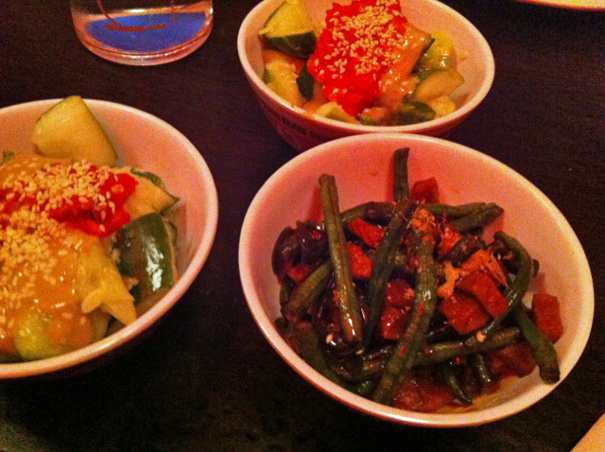 Most prominent among my selections were Mission Chinese Food and Pok Pok NY. 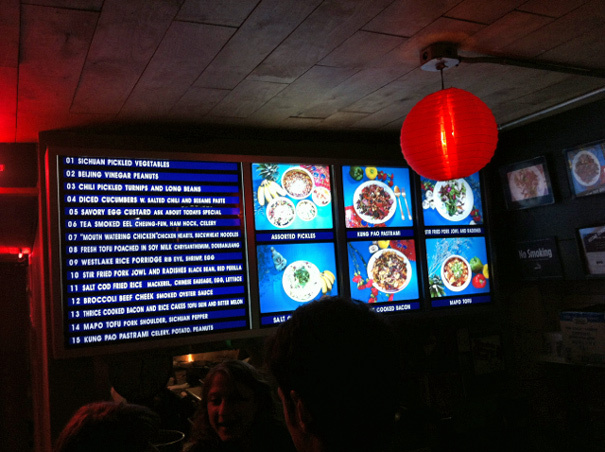 Both restaurants are transplants from other cities: Mission Chinese from San Francisco, Pok Pok from Portland. Both are phenomenons. Both have enormous lines. Yet I told myself these were places I had to visit before returning back to L.A. or I’d be forced to hang my head in shame. 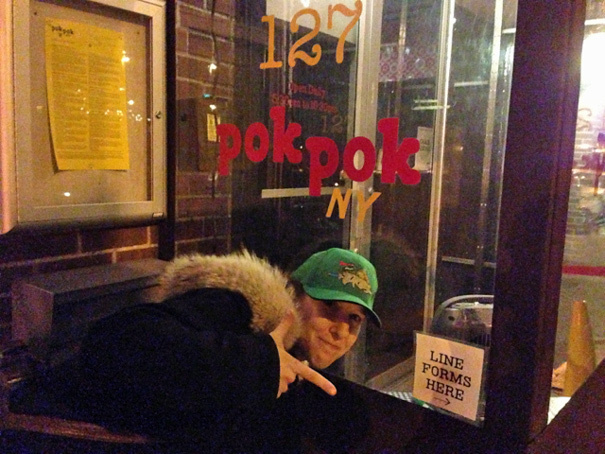 Now I can go back to L.A. with pride because I Mission Chinesed, I Pok Poked and lived to tell the tale. Actually, that’s the crowd in front of me. Behind me it was that times 3. But once it’s your turn, you’re whisked away to a back room that has the feel of a speakeasy, or a party in a friend’s basement. Also: the lighting is very, very red. 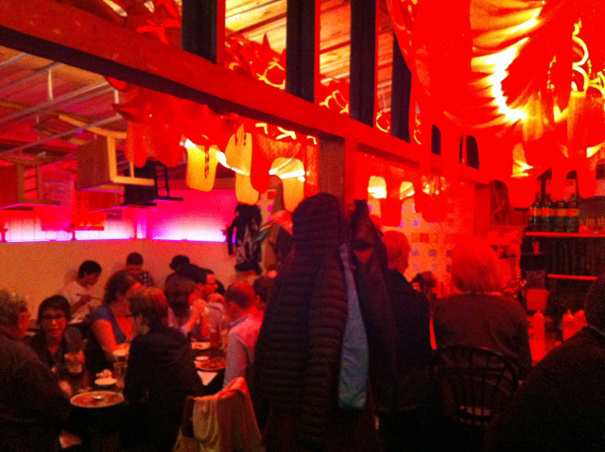 In fact, the lighting is so red back there that I almost decided to delete the Mission Chinese portion of this post because the pictures are just so, so red. Can you trust me that it tasted absolutely wonderful? 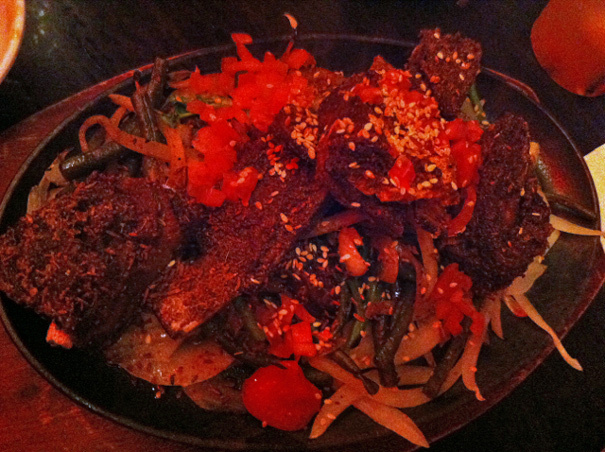 The cumin so pronounced, so prominent it made your entire face feel like a dirty sock…in the best possible way. It’s a shame, because that’s the best fried rice I’ve ever eaten in a restaurant. It’s the closest thing I’ve experienced to the life-changing fried rice Grace Young taught me to make for my cookbook. 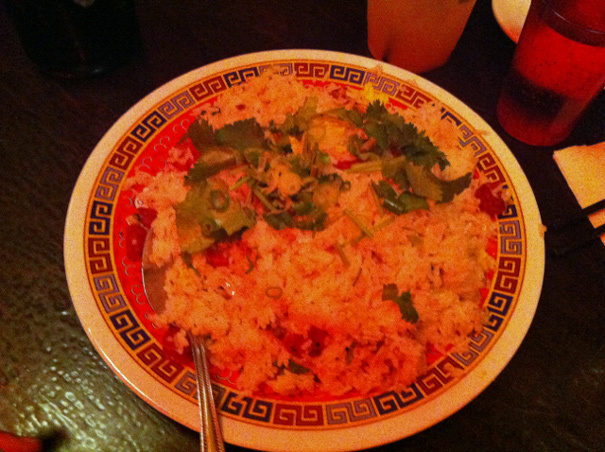 In both cases, the quality that sets the fried rice apart is its clean, clear flavors. There’s nothing brown or gunky about it. It’s all about purity of ingredients; it honors the rice. 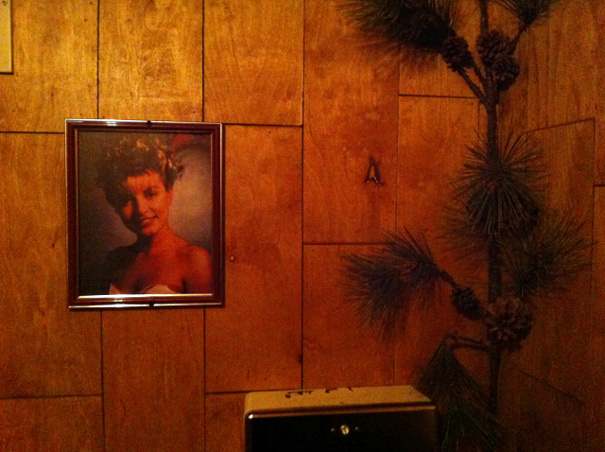 It even plays that haunting theme song while you pee. 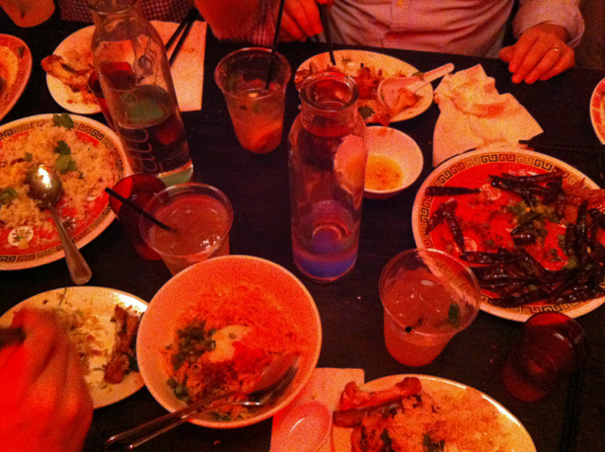 Now fast forward a few weeks; that Mission Chinese meal took place back in November. 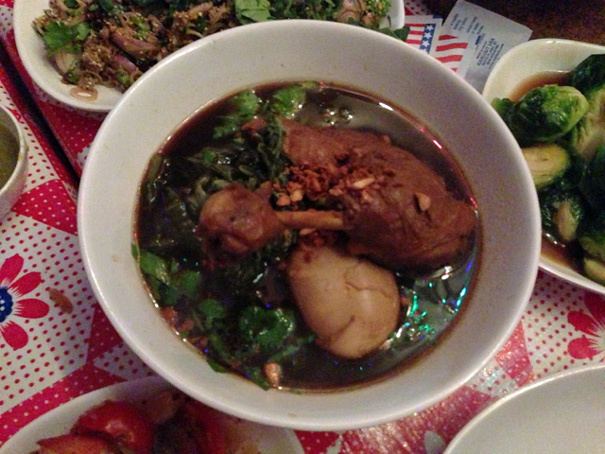 Last week, here in December, I made the journey out to Brooklyn to eat dinner at Any Ricker’s Pok Pok; a place that Anthony Bourdain said, on his show, that serves the most authentic Thai food he’d experienced outside of Thailand. 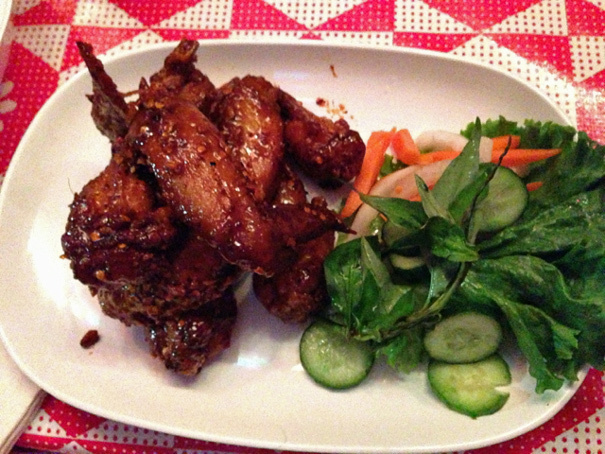 In the category of comfort, Pok Pok easily beats Mission Chinese. At the latter, I was constantly jostled by waiters who seemed annoyed that I was sitting at my table eating dinner. 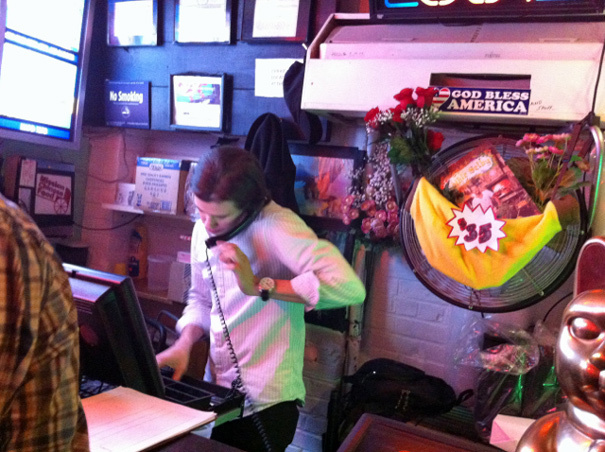 (My seat was, through no fault of my own, blocking a pathway the servers needed to take past the bar to other tables.) 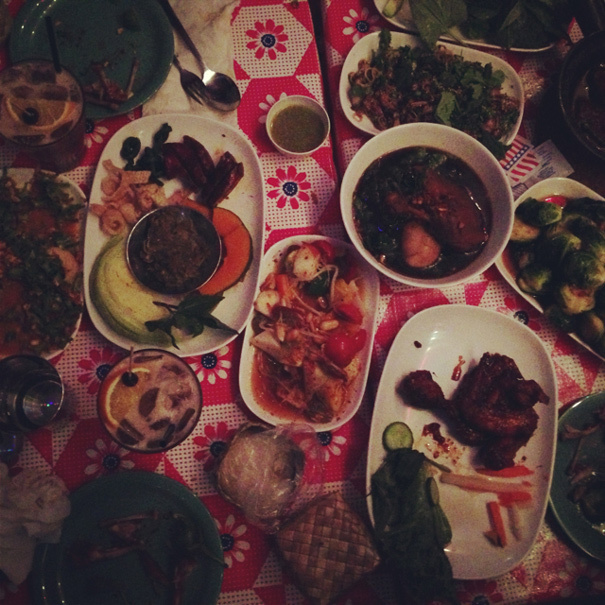 At Pok Pok, the tables are more nicely spaced apart. You can actually hear yourself think. 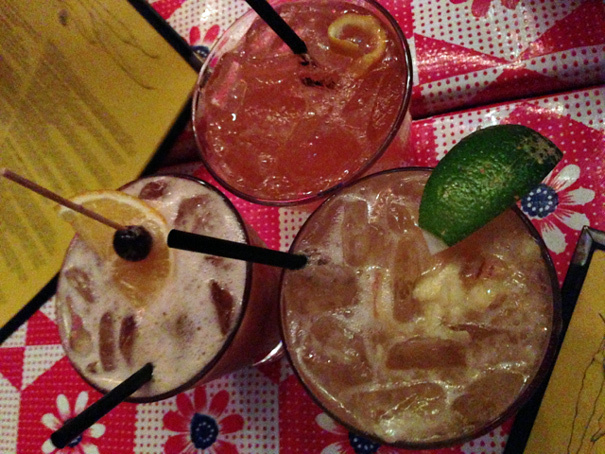 Right away, Pok Pok blew me away with its cocktails. 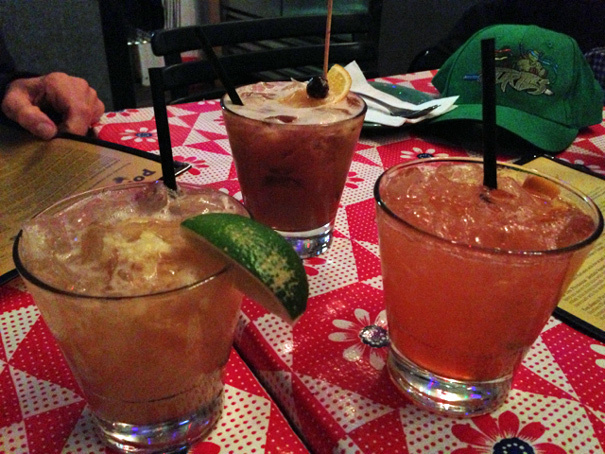 I absolutely loved my Khing & I (in the foreground) made with Mekhong, lime, and house made ginger syrup on the rocks. That ginger really packed a punch. But I liked JJ’s Tamarind Whiskey Sour (at 12 o’clock; made with Tamarind, fresh lime juice, palm sugar and Bourbon) so much, I ordered it for round two. I think I had it right the first time, but don’t tell her I said that. Totally crispy and crunchy and then coated in a sauce that’s equal parts sticky, spicy and sweet, I could’ve eaten this whole plate, the wings were so good. Instead, I did the decent thing and shared. 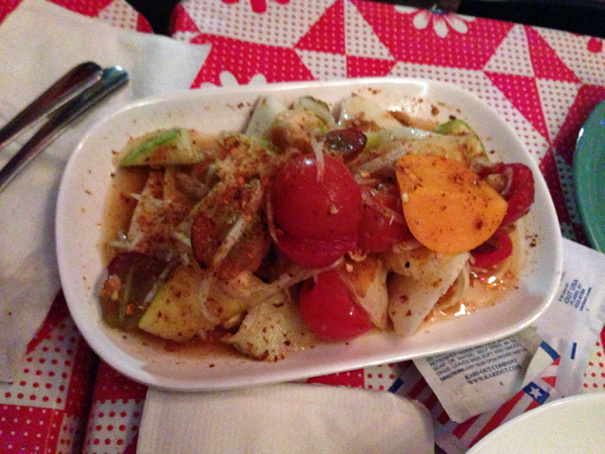 I think I preferred this fruit salad, which came dressed in a potent vinegar mixture and dusted with spices. 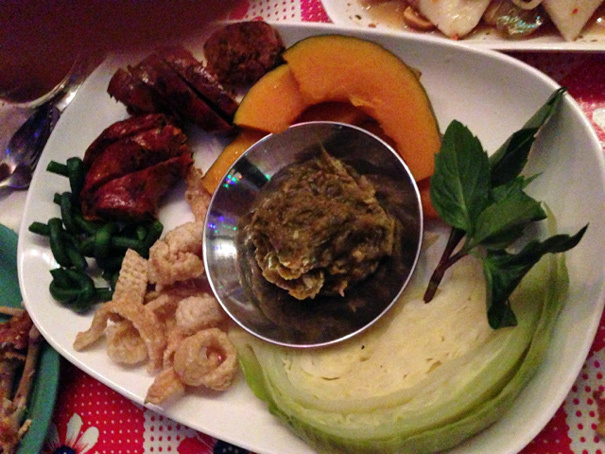 J.J. explained that the normal papaya salad treatment happens to all kinds of different fruit in Thailand. This salad illustrated that very well. 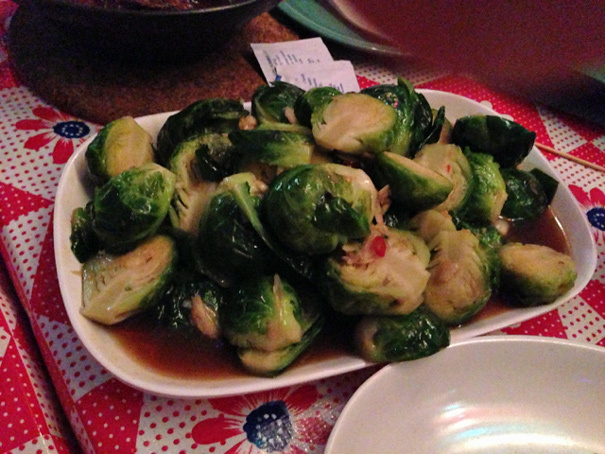 Just steam your sprouts and dress them in a vibrant dressing, and you have a healthier but no-less-tasty alternative. 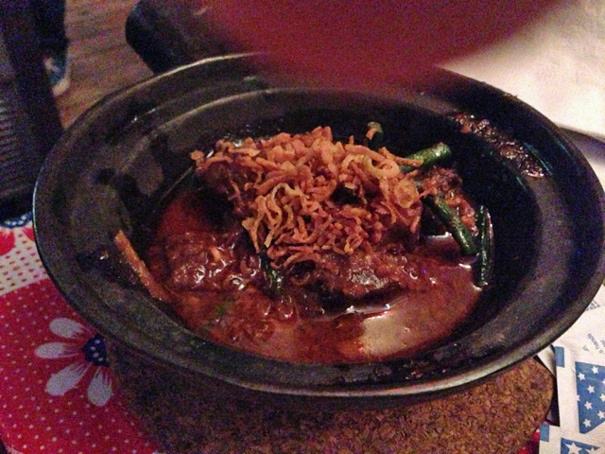 It was unbelievably rich and flavorful and, after all of the spicy food we were eating, refreshingly sweet. I knew we had to have sausage because when my friend Patty went to Thailand and did a guest post for me, that was one of the main things she wrote about–the prevalence of sausage there. 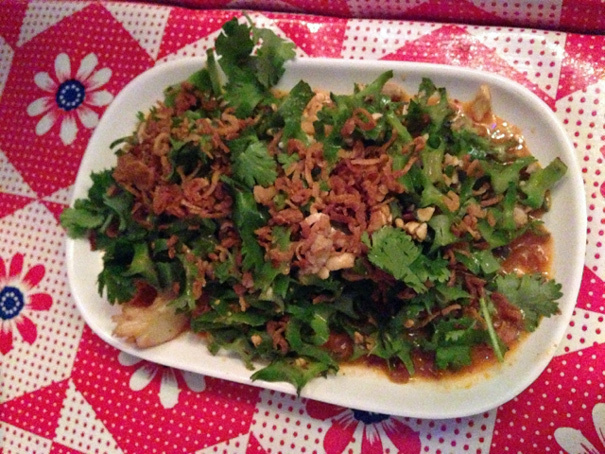 And this dish did not disappoint. Also, the spicy green chile dip is a good opportunity to explain Pok Pok’s name: as J.J. explained to us, it’s the sound that’s made as the mortar hits the pestle when making a spicy paste like the one we ate here*. Having been featured in an NPR segment about mortars and pestles, I nodded my head knowingly. At this point, I was getting pretty full, but when you’re eating dinner with a chef’s co-author, more food tends to come out. 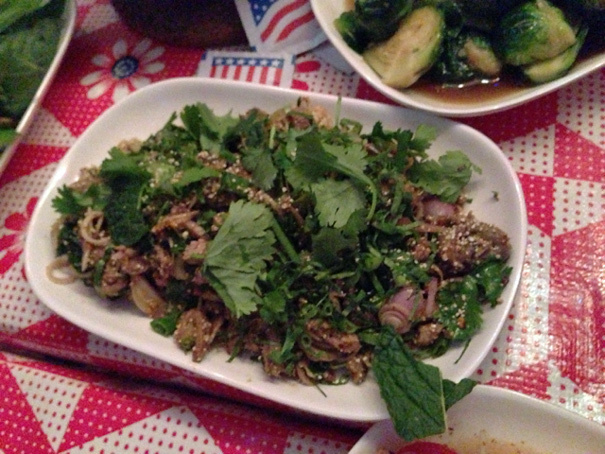 Like this Laap Pet Issan: Spicy Northeastern Thai chopped duck salad with duck liver and skin, lemongrass, herbs, toasted rice powder, dried chiles, lime juice and fish sauce. And here’s an overhead shot of the table—this time it worked, Emily! 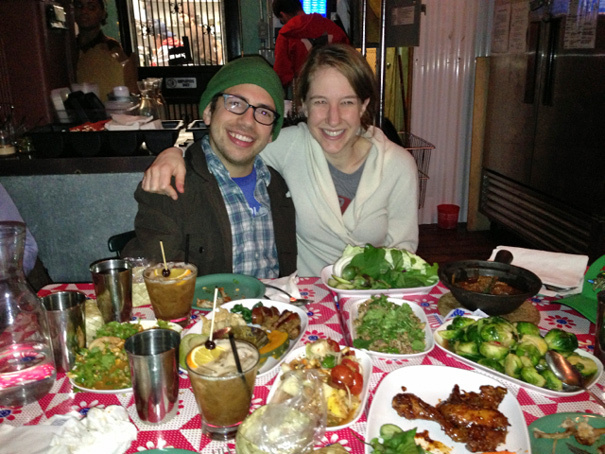 Looking back at these meals, I feel extraordinary lucky to be living in a time and a place where you can hop on a train for 20 minutes and eat a meal that instantly transports you halfway around the globe, whether to China (at Mission Chinese) or Thailand (at Pok Pok). What an embarrassment of riches available to us here in New York in 2012. I’m so glad I bookmarked these places when I did; they didn’t disappoint.